Mr. Garrick in the Character of the Drunken Sailor, Isaac Taylor, 1778, British Museum. David Garrick was quite possibly the most famous actor of the English world in the eighteenth century. His career was long and fruitful. In many ways, Garrick changed the way theatrical productions were created and delivered to audiences. This print came out only the year before his death at sixty two. 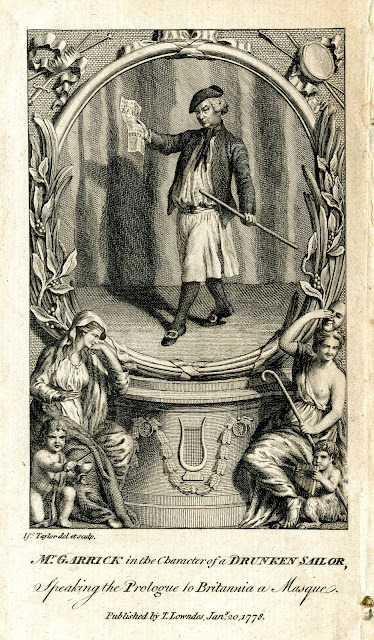 This specific print portrays him in his role as an intemperate jack in the play "Britannia, a Masque." 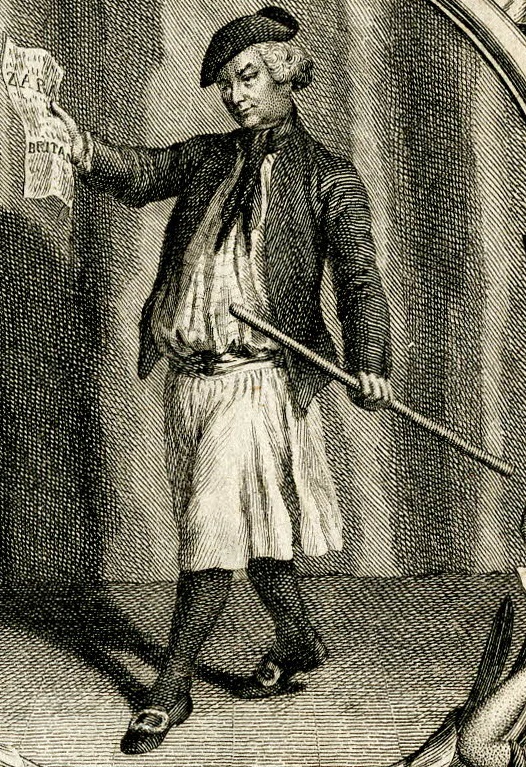 Garrick wears a reversed cocked hat, and his hair appears short, though it could be tucked up into the hat. I am unfamiliar with how actors would wear their hair, or if they preferred wigs in order to allow more fluidity in the roles they could portray. Either way, he wears a black neckcloth and a striped shirt with no waistcoat. His jacket is without buttons, pockets, or slash cuffs. Garrick's slops about his waist end below the knee, and black stockings sheathe his legs. Pointed toe shoes with oval buckles carry him across the stage. In Garrick's left hand is a stick, and in his right is a paper that I presume served some purpose in introducing the play. These images beg us to be especially careful in our conclusions. While the general appearance is probably fairly reliable, this is twice removed from our subject of study. It is an actor in a costume who is then relayed by an artist to a print. The jacket may be a good example of this: without any buttons, it would not be a very practical item for sailors to use at sea!